This custom-designed stunner of a knife features a hefty blade of Damascus steel with a pronounced clip point and sharp edge. Handsome details abound, including the genuine stag handle and brass-plated guard and pommel. Colorful pakkawood spacers add further attention to detail to the handle design. A custom brown leather sheath is included. When I opened my package, I was very impressed. Wrapped well and oiled. Very sturdy. Not very sharp but an easy fix. 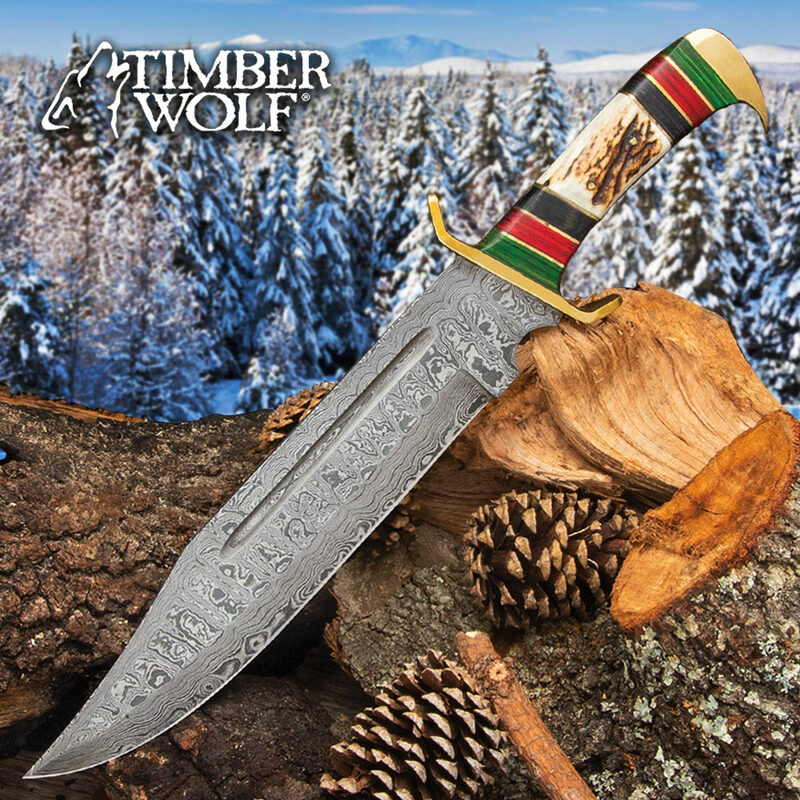 This knife a must have for survivalists, hunters, and Soldiers. You can feel the ridges in the steel indicating that this is a true Damascus Steel Blade. I gave it a professional cleaning and even though it was very sharp upon arrival I gave the knife high quality finishing edge that holds nicely. The size and heft of this weapon shows it is a not wall decoration. Although with the stag antler hilt, tri colored wooden spacers, and pommel to hold the full tang blade, it is definitely a superior tool/weap full The blade is thick and very strong. I tested on the forest in my back yard cutting branches, vines, even small logs and it holds up beautifully. Truly a superior knife for anyone who wants a defensive weapon or a survival tool. If you don't get this fine knife at the extremely fair price, you are doing yourself a disfavor. This Bowie arrived this weekend. I knew it would be a nice one but I never expected it to be this nice. From end to end it's all knife and all a work of art. 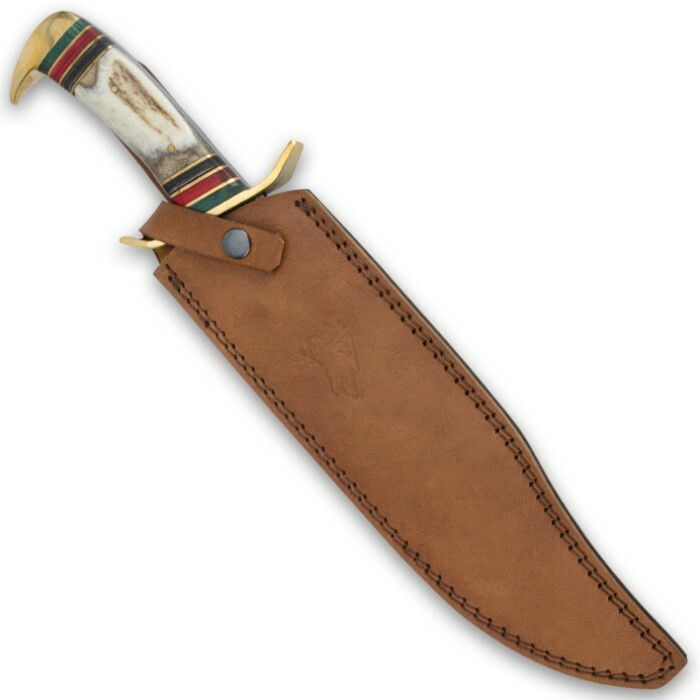 It's very heavy and well made with a high quality leather sheath to compliment it. If you are a collector like me . . . . you don't want to pass this one up. It's a lot of knife for the money. This is a beautifully made, weighty, thick and very sturdy knife in a very sturdy sheath. You need this. A real 5 star treasure. This was an excellent knife. The blade has kept a nice edge,very nice sheath that fits the knife well. The price is also an outstanding bonus. I was not able to bypass this outstanding opportunity. Got this knife at 30% off. A real good price for this blade. A beautiful knife for the cost. I am a collector and do not plan to go out and hack branches with this knife. So for my purposes, it is an excellent buy, especially if you get it during one of the 25 or 30% off specials. 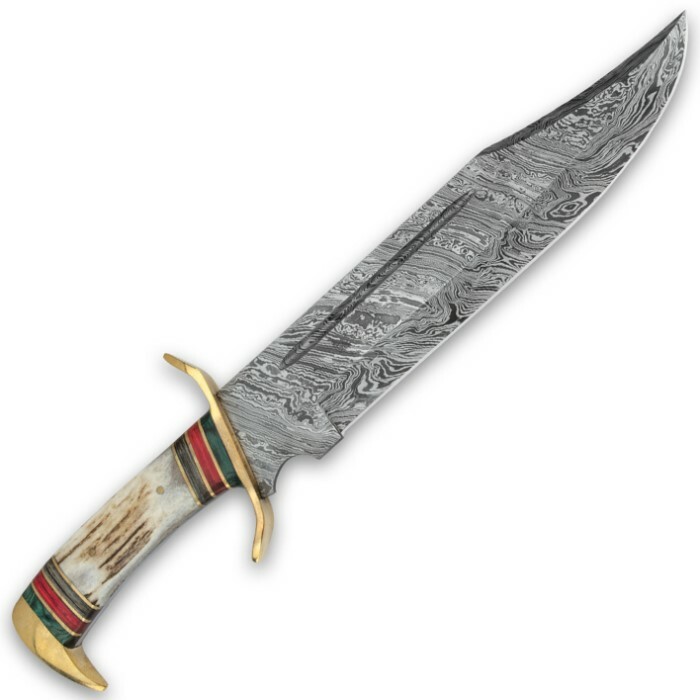 The knife appears to be very similar to the Timber Rattler 17 TR68 knife differing (in appearance) only in the Damascus pattern and the color of the stag handle. I am a great fan of Timber Rattler knives but could not turn this Timber Wolf Knife down especially at a $50 lower price tag.